A friend of ours from church brought this dish over after Liza’s surgery. It kind of reminds me of a chicken cordon bleu. She said it was a family favorite and it turned out to be a hit with our family as well, including the kids. You can’t beat that. Mix the cream of chicken soup, sour cream and Worcestershire together and pour over the chicken wrapped in ham and cheese. Bake at 350º for 1 hour. Take out and spread shredded mozzarella on top of chicken and bake for an additional 10-15 minutes or until golden brown. 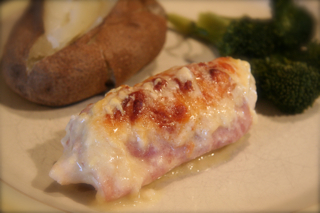 The sauce in the dish is great poured over baked potatoes or broccoli. Can be made a day in advanced and can also freeze. This dish makes for wonderful leftovers!